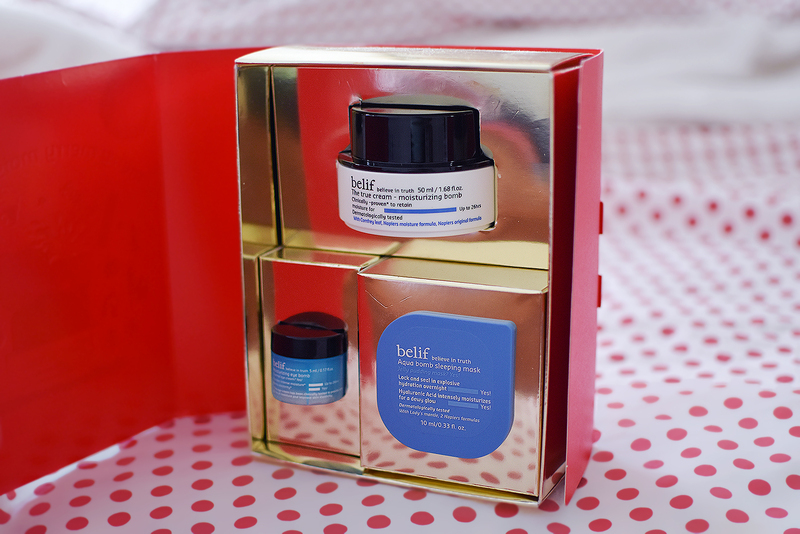 The cute packaging is to blame that I bought this Belif Merry Merry moisturizer set, few weeks ago, so I want to share with you guys what I liked about this set and what I was disapointed about. This is an ultra-lightweight, oil-free formula that is gel-cream consistency and instantly absorbs into skin, cools and refreshes my dry skin. 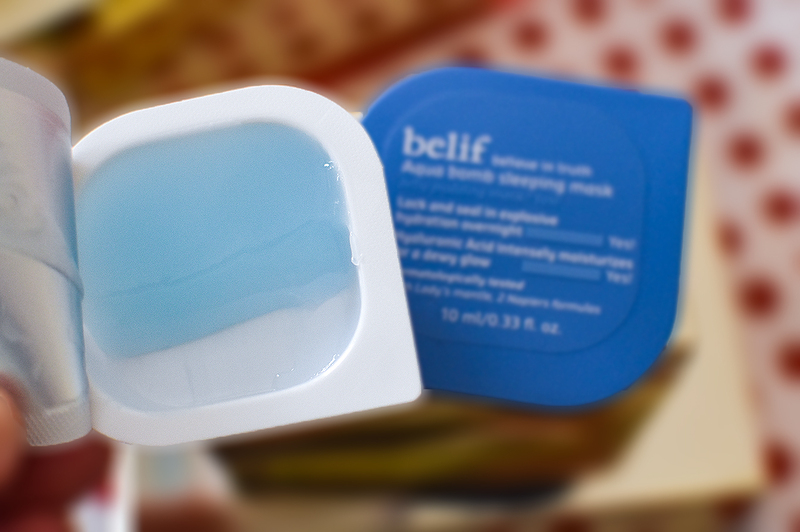 As the product claims, it's a perfect solution for dryness, pores, dulness, and uneven texture. From my experience, I can say that it did nothing in terms of dulness, pores, and uneven texture, but what I like about this moisturizer is that it's lightweight, it absorbs quickly and hydrates my dry skin and is perfect under makeup. Also, it doesn't irritate my sensitive skin and doesn't contain harsh chemicals like Parabens, Sulfates, Phthalates, it's also free from mineral oils, Synthetic preservatives, dyes, fragrances and animal origin ingredients. I have mixed feeling about this eye moisturizer. 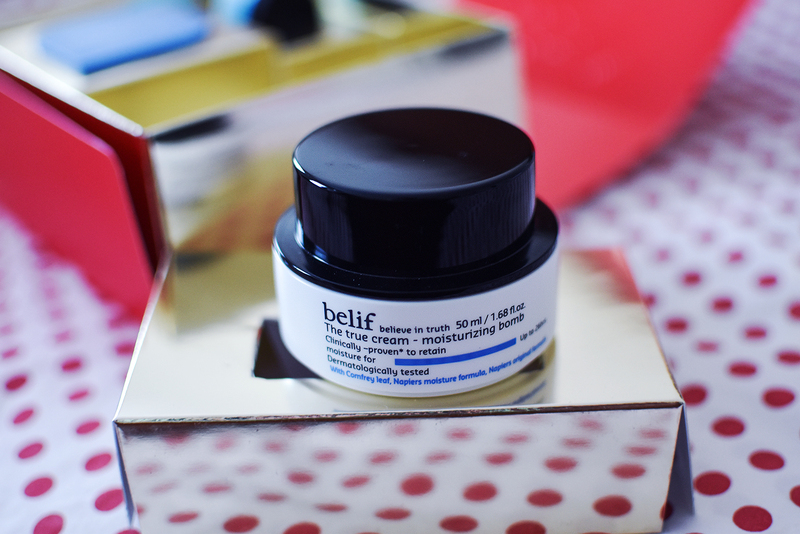 I like the texture of it that has cooling effect, it seamlessly blends into skin and is nice under makeup as well, but I have doubt, this Belif Moisturizing Eye Bomb is the reason I got millia (two small bumps) under my eye. (For those of you who haven't heard of it: Milia are small, white bumps that appear on the skin. They are caused by keratin that's trapped underneath the surface of the skin.) So, I recently stopped using it. This Aqua Bomb Sleeping Mini didn't work for me __ I used once and after I noticed how dry my skin became, I haven't tried second time. Maybe, someone with oily skin would like it but it's not for my dry, sensitive skin. So, even though, I enjoy the face moisturizer from this set, I will definitely be more cautious about choosing any product from this brand in future. Have you used any of these skin care products? Let me know how you liked them. So sorry that these didn't cut it for you! I have used the moisturizing bomb and loved it. I've never heard of these but they sound great! I had a few samples of that moisturizer and liked it but not enough to buy a full size. Good to know about the eye cream, yikes to milia! They are quite stubborn to get rid of. Now I know how difficult it is to get rid of them, especially under eye area where the skin is so sensitive. I tried the moisturizer and I loved it!! Too bad they didn't do much for your skin! This is so lovely dear, I have not used it before. I've never heard about these products before so thanks for sharing! The packaging is adorable. Sorry to hear that some of these products didn't work for you. It all really comes down to the skin type, some products may work well for others but not for myself. I used to have oily skin but now it's more combination, plus I have dry patches. I feel nostalgic for my oily skin days, I never thought that would happen, but now I see that oily isn't the worst and that dry and sensitive skin is so hard to take care of. Aw no, I'm sorry these didn't work out for you. I've only heard good things about these products, so it's nice to hear some downsides too for a fairer perspective. Thank you!! The packaging is rather cute and sorry to hear that the products didn't work for you hun! I know, the packaging is so cute, right? yes, unfortunately it ddn't work for me. Oh my, this packaging is the cutest :) Thank you so much for the review ! This moisturiser sounds good and the packaging looks cute. I have never heard about this brand, thanks for sharing! Yes, the packaging is super cute! Love the packaging! Thanks for sharing babe! Haven't heard of this brand, but looks really interesting. I'd love to try this myself, thanks dear! Thanks for sharing these items, Nina! I hadn't heard of them! They look so good, I need to try it ! !